While we applaud LG for breaking the mould with the screen on the Optimus Vu 2 we can't help but think the handset is just a bit too impractical. The oddly shaped screen will put a lot of people off and it doesn't offer anything particularly outstanding. Eyebrows were raised when the first Vu was announced last year, but LG has obviously deemed it enough of a success to churn out a new iteration. Global release dates and availability for the Optimus Vu 2 are currently unknown, but the handset is already on sale in LG's native Korea for 966,900 won (around £530/$860) and we'd expect it to hit other markets round the world in the coming months. 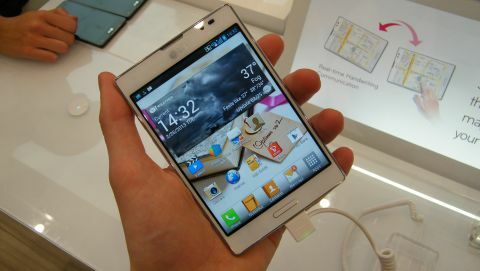 You still get a 4:3 aspect ratio display, which clocks in at 5-inches and boasts a 1024x768 XGA resolution. The odd shape of the screen means the Optimus Vu 2, likes its predecessor is more of a square shape which makes the handset very wide and difficult to hold in one hand. LG has managed to keep the weight down on the Vu 2 and the frame is quite thin so while your fingers may be struggling to properly wrap round at least your wrist isn't giving way. It looks like a premium device thanks to the metallic frame running around its perimeter, but the sturdy chassis of the Optimus Vu 2 is predominantly plastic with no brush aluminium in sight. To help manipulate the expansive display LG bundles a stylus with the Optimus Vu 2, but there's no space to slide it into the handset like you can with the Samsung Galaxy Note 2 which makes us think it will get lost in a matter of days. The screen itself is bright and responsive and we had no trouble navigating our way around Android, although we were disappointed to find the LG Optimus Vu 2 was only running Ice Cream Sandwich and not Jelly Bean. With a 1.5GHz quad-core processor and 2GB of RAM the Vu 2 has plenty of power under the hood and that makes for a smooth user experience and apps which open quickly. You get 16GB of internal storage in the Optimus Vu 2 and there's a microSD card slot on hand if you feel the need to expand the memory capabilities. LG has pre-installed Google Chrome alongside the stock Android browser, and thanks to its 4G connectivity, strong Wi-Fi support and powerful processor we we're able to nip around the web at a decent pace. Both desktop and mobile sites looked good on the Optimus Vu 2, and the 4:3 aspect ratio makes viewing full versions of websites easier. Video playback on the Vu 2 was pretty good, but it isn't the best we've seen on a smartphone and the 4:3 display really isn't suited to cinema footage, as you're stuck between having large black bars above and below or a distorted image if you want it to fill the screen. The Optimus Vu 2 comes with LG's QSlide feature, which lets you make the video you're watching become a transparent overlay on the handset, allowing you to use other features of the phone without interrupting playback. There's a slider present at the top of the display allowing you to adjust the opacity of the film and the transition from movie watching to the transparent, multitasking layer is a smooth one. Another LG innovation is Vu: Talk which allows you to share your screen with another Optimus Vu 2 and gives both users the ability to draw on screen, share maps and make notes in real time and even during calls. It's a pretty impressive feature but due to the limitation of both people requiring the handset to make it work, it's one we fear won't get a great deal of use. The 8MP camera on the back of the LG Optimus Vu 2 produces some pretty good quality images, and with features such as a flash, HDR, panorama, burst mode and a voice controlled shutter the app is well stocked. Shutter speed is quick and the voice controlled option is a fun way to take photos, with the simple command of "cheese" or "smile" enough for the Optimus Vu 2 to snap a picture. There's also a time machine mode which will take five photos before you hit the shutter, to ensure you don't miss the action you're trying to capture and it worked pretty well when we tested it out. Thanks to the large size and awkward shape of the LG Optimus Vu 2 one handed typing is a bit of a struggle, but you can set the keyboard to bump up to the left or right of the screen to make it a little easier. However this adjusted view means the keys become bunched up and the cramped layout can lead to mistakes. While we applaud LG for breaking the mould with the screen on the Optimus Vu 2 we can't help but think the handset is just a bit too impractical. The oddly shaped screen will put a lot of people off at point of sale and it doesn't offer anything particularly outstanding over the competition such as the Samsung Galaxy Note 2. If you want a big screened LG handset you're probably better off checking out the Optimus G Pro which sports a full HD, 5.5-inch display - although you don't get a stylus with that.